Sarah Cada started volunteer 10 years ago on 10/18/2007 when she was 17 and in high school. She has since graduated college and is now an elementary school teacher in Marana. 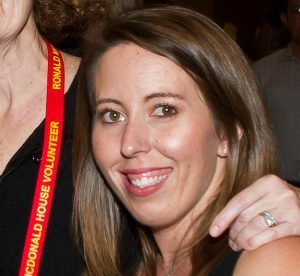 I started volunteering at RMHC when I was 17 to fulfill a requirement for my government class. It didn’t take long before I fell in love with the house, the families and the people I work with. For the last ten years I have considered RMHC home. I take every opportunity I get to share my love of the house with those I care about. My parents and I decorate the living room every Christmas, I am the Pop Tab Coordinator at my school, and every Mother’s Day my friends and I cook for Chef for a Day. I constantly get asked why I still volunteer at RMHC and the answer is simple; volunteering at RMHC has changed my life. I have had the opportunity to celebrate with families, build relationships with volunteers and watch miracles happen. I am so thankful for everything that RMHC has done for me, I would not be the person I am today if it wasn’t for the house that love built. Sarah has volunteered for the past 9 House Parties, all four Walk for Kids events, as well as assisting with flower arrangements for events, and volunteering on 8 of the last 9 Thanksgivings to assist with dinner prep and clean up. even while recovering from a major surgery, Sarah continued to volunteer here at the House. She has volunteered over 1200 hours! Thank you, Sarah!